49 CFR and IATA/ICAO (English) training packages are currently available using Adobe® Flash® technology. This version features animations and instructional audio by GSI trainer, Sam Burton. With the click of a mouse, the student may select any particular Lesson within the module, as well as any page within the lesson. The student may also follow the navigation arrows to take the training course in sequential order. When the student feels he/she has mastered the content of the material, he or she may take an evaluation test of the current module. In order to do so, he or she simply needs to make a click on the "Test" button within the current lesson. 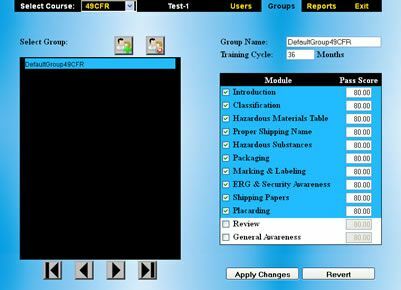 Once the test-module opens, a randomly selected pool of questions related to the curent training module will appear in the screen. The student will be able to navigate within the questions at his / her own pace and select an answer. Once all of the questions have been answered, the student will have the option to grade the test. Once the test has been graded, the student will be able to print a hardcopy of the evaluation. This hardcopy will include: the student's name, the training agency (GSI Computer Services, Inc), the questions, the answers given, the correct answers, the test score obtained, and finally a signature box to be filled by the hazmat coordinator in charge. You may also try the following demo-links to our web-based hazmat training courses: You will need a modern web browser and Adobe® Flash® plugin version 8.0 or greater required to run these demos. Only the web-based computer based training packages allow a particular student to print a certification with his / her name, modules completed, the scores obtained, the name of the company, a certification date and an expiration date. (Upon expiration of the certificate, the student needs to be re-trained in the respective course. i.e. after 3 years for 49 CFR). Monday through Friday 8:00 AM to 5:00 PM central standard time. This option allows big corporations to train and certify an unlimited number of employees via the internet or the corporation's local intranet. Under this option, multiple training sites are linked by a global master hazmat training administrator. Within each site, each local site administrator is able to set up training groups, with specific training requirements according to his/her employees' job functions. (A training group requires particular students to complete certain training modules i.e. Shipping Papers with a specific minimum passing score). The local site administrator is also able to set up students, change their personal information within the system, make searches, deletions, monitor student test scores and even set the amount of time a particular course certificate (i.e. IATA/ICAO) is valid for. When such certifications expire, the site administrator is also capable of allowing students to be re-certified while maintaining previous certification information (expired certifications) on record for an unlimited amount of time. Site administrator may also print reports reflecting training information for the students under their site. This includes reports for current training, expired certifications, and even forecast reports to show students whose certifications will expire in a certain amount of time. 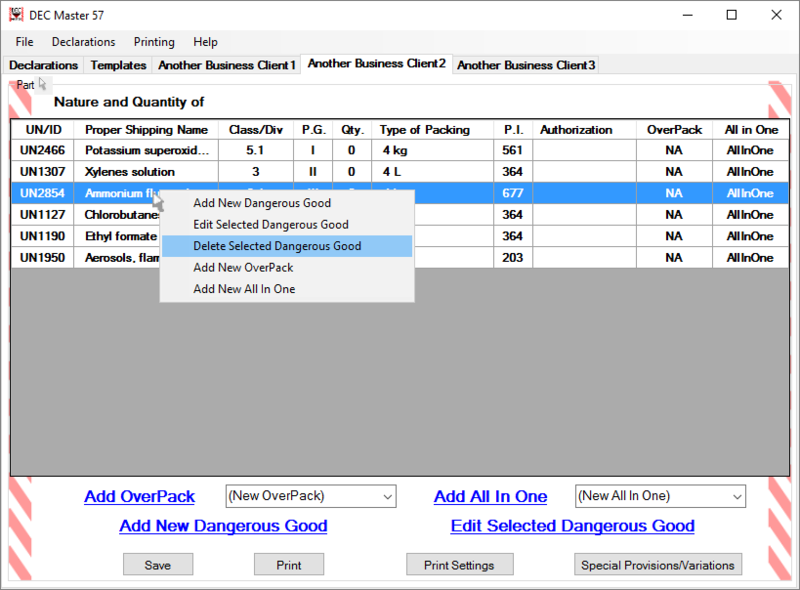 Improved validation for the dangerous goods. 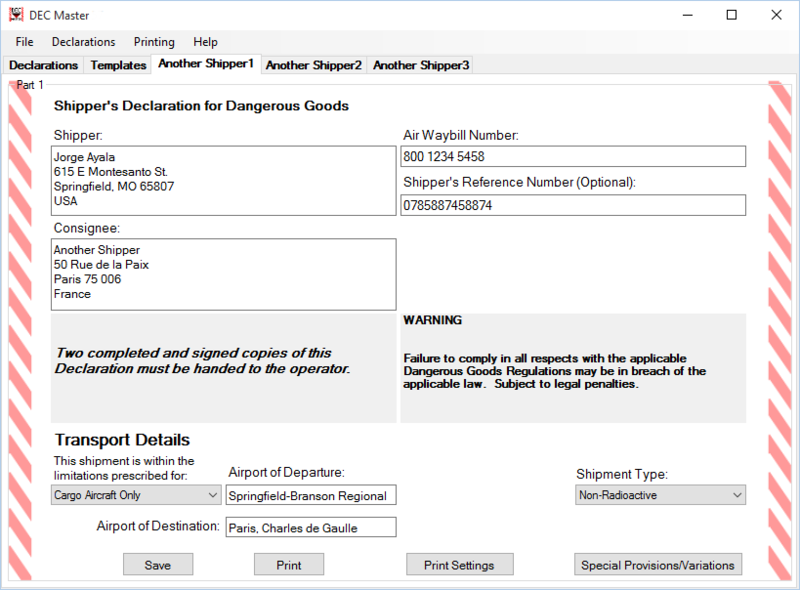 US State and Federal Express Operator Variations are included as a reference. Special Provisions are included as a reference. All in One Package support. Ability to override all the validations if needed for special cases. 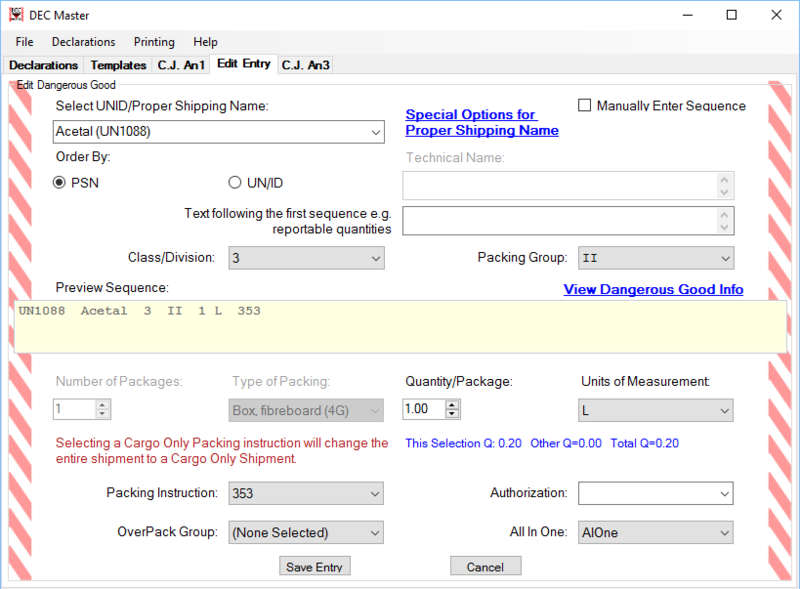 The Dec Master software divides the Shipper's Declaration of Dangerous Goods in 3 different sections, and allows the shipper to fill-in each section as a web-form. The Print Layout module lets you move the actual content of the final print-out a certain amount (specified by very small increments) to the right or left of your page border, as well as a certain amount below or above from both your top and bottom page margins. 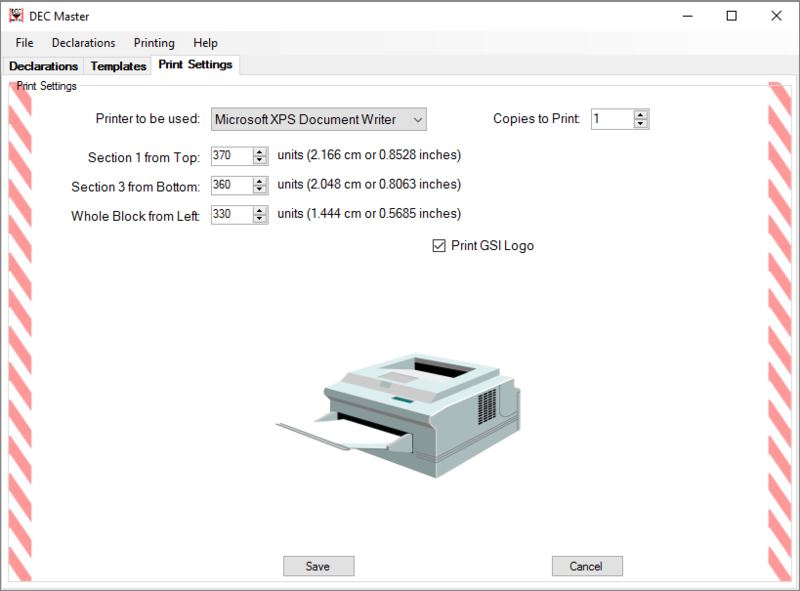 The Print Layout module also allows you to choose a a particular printer installed on your network to be used to print declarations and templates. It also allows you to specify how many copies of the such declarations or templates you want. 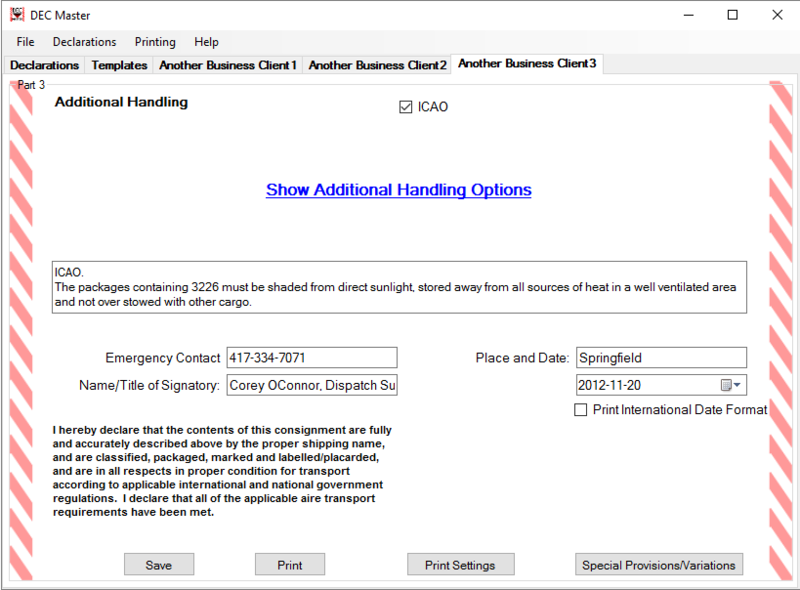 The settings specified will be kept and applied for every single declaration or template printed. 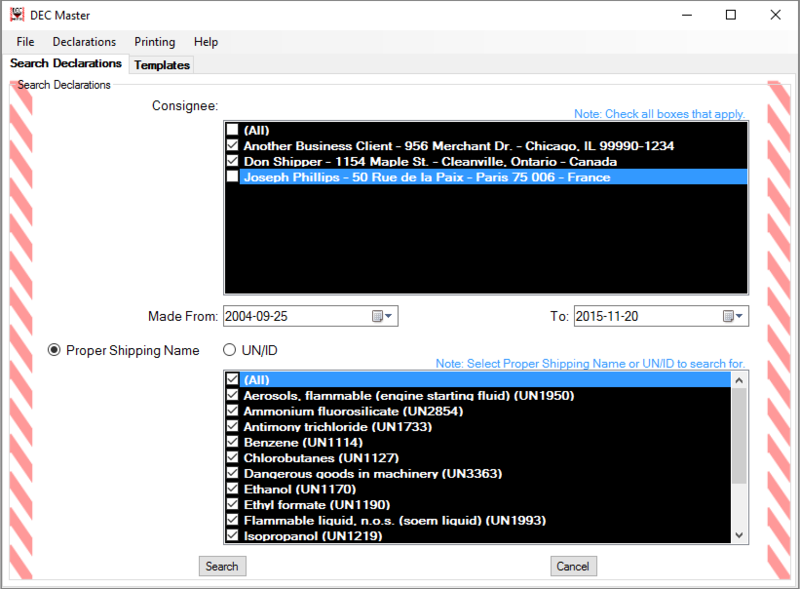 The Dec Master software application allows you to keep your templates and declarations on a local database, so that you may sort them by either Consignee, Date or Air waybill number. DEC Master supports overpacks. 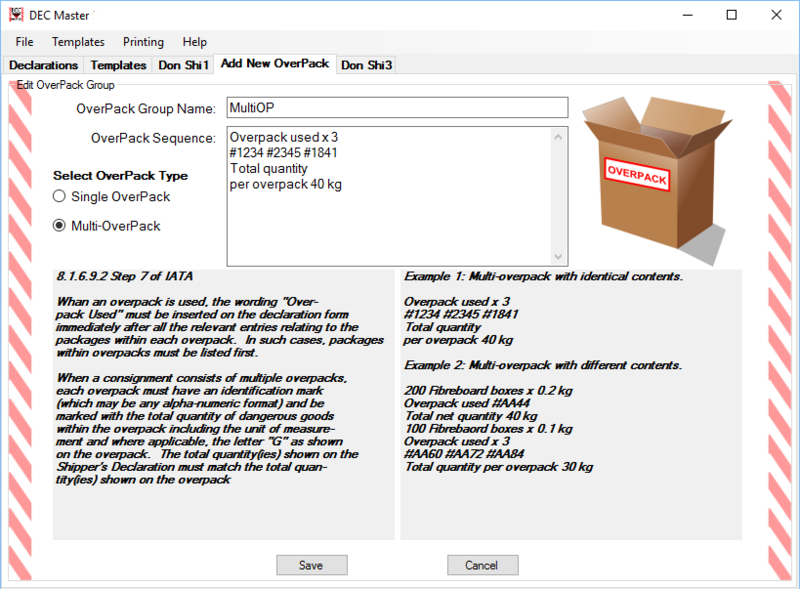 Complex shipments and multi overpacks are supported. 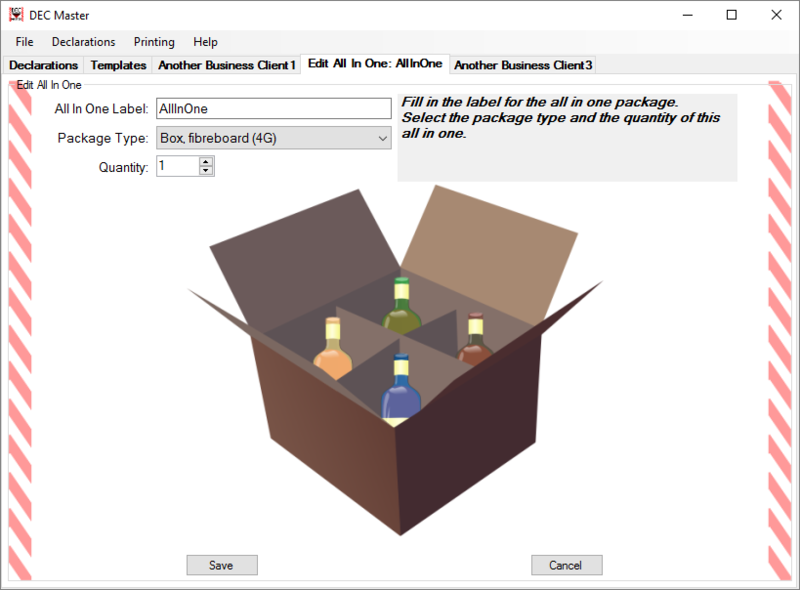 DEC Master supports All In One mixed shipments. The Q value is calculated within the sottware. The new way to add and edit the dangerous shows the actual sequence in a preview before printing. Many advanced features now include more checks, more visibility and more user friendly advances. 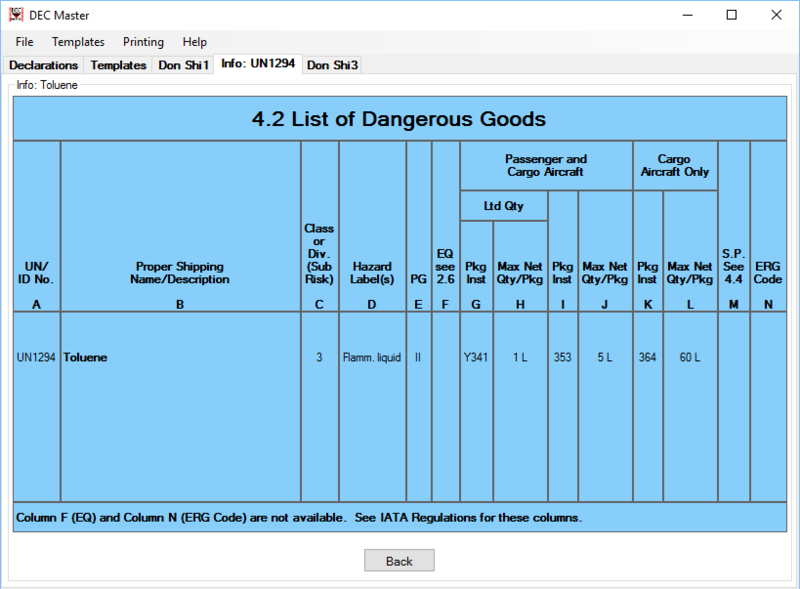 Information from the table in the regulations is shown within the software. Some information may not be available. Each program comes with with a binder, program information, CD and 100 Shipper's Declaration forms (1-part).